That's a wrap from us for the night then - here comes Match of the Day online and on BBC One. Regional variations apply. An 89th-minute deflected strike from Willian gave Chelsea a victory over Everton that maintained their seven-point Premier League lead. Substitute Chris Smalling scored twice to help Manchester United overcome battling Burnley and climb up to third in the Premier League table. Sergio Aguero scored his first goals since December as Manchester City secured victory at Stoke. Crystal Palace manager Alan Pardew earned a point in his first match against former club Newcastle as Fraizer Campbell's goal secured a draw. Don't forget you can see all of the talking points from the last two nights on a midweek Match of the Day! Brace yourself for these regional variations: 22:45-00:15 on BBC One and 23:10-00:40 on BBC One Scotland, with BBC One Wales at 23:10-00:40 and BBC One Northern Ireland 23:40-01:10. West Ham boss Sam Allardyce has also confirmed that the club's bid to sign midfielder Lassana Diarra will not go ahead due to administrative issues. Paul in Fulham: At the Chelsea game tonight. I have never seen an instantaneous standing ovation for a piece of skill such as that when Cech saved from Lukaku tonight. Particularly impressive as he was a near spectator for much of the game. Great to see. John on the way home from Stamford Bridge: Chelsea dominated and had to put up with Everton's constant fouling. Fair red card and fair result! Jay from London: I can understand why everyone is desperate for Chelsea's best players to be banned, but please stop talking up the Ivanovic incident. He was just one player in a moshpit out there, and the ref saw the whole thing. Do not ban. Swansea are in 9th place in the Premier League table. Are they really not safe? "We were very poor, we had no tempo to our game. We made them look an amazing side, that's how poor we were. "But credit to West Brom, they got their two goals and deserved their win. "We can't approach a Premier League game with this type of intensity and tempo and expect to get anything out of the game. We huffed and puffed without creating anything. "If we play like that in any league games coming up for the rest of the season then we will be in trouble. "We lacked in all areas today. There wasn't too much in it in the first half but in the second half we didn't have the intensity." "Jurgen Klinsmann has always been associated with Aston Villa, even during the Doug Ellis reign. I also know that Randy Lerner really admires David Moyes, but could Moyes be lured away from Spain? But I'm not sure Lerner will still be there at the start of next season. "Villa have a good squad of players and Paul Lambert deserves credit for having nurtured them with very little money at his disposal. They just need a good coach and if he can sort them out I think they'll be alright." West Brom manager Tony Pulis on 5 live sport: "Is that the real Neil Lennon there in the 5 live studio?? Hello, Neil. "It was a good performance tonight. We're pleased, but it's small steps towards where we want to go. Lets keep our feet on the ground. But we looked like a team tonight and it's the best performance since I've been here. And Swansea are a good team. The lads have to take a lot from this but make sure they understand how difficult the upcoming games will be." "If the replays show something, questions will so straight back to Jose Mourinho." "It is probably the best performance since I have been at the club, but it is only one game and we need to replicate that. "We deserved the three points tonight and I don't think anyone can deny that. "Ideye Brown is a good lad and he has got a good attitude. He has trained well and worked a hard. It didn't work out for him at first but we have given him his chance and he has taken it. "Victor Anichebe is injured so we only have those two strikers to the end of season, they played well today and I'm very pleased they got the goals. "But we have midfielders that can also get goals and would be looking for the defenders to contribute too." "That wasn't good enough from Manchester United. Some better finishing from Burnley and if David De Gea wasn't on top of his game then Burnley really could have got something from tonight. "And United's players have been working together for seven months now and they still look like strangers. They still look like they don't know where they should be on the pitch." Chelsea boss Jose Mourinho, who was last month fined £25,000 for saying there was a "clear campaign" against Chelsea, was not prepared to discuss the Branislav Ivanovic incident post-match or the possibility the Serbia defender would be banned. Mourinho said: "I'm concerned with my reaction, because one more question I leave. The next question for that story I have to go." Newcastle caretaker manager John Carver: "It's another game unbeaten, that's one win, three draws and two defeats now, which is not bad in this league. We said before the game we knew we were up against a big physical side and the pitch was quite lively, so we knew it was going to be a bit of a battle. "I stuck Papiss Cisse in. I was brave to play two strikers away from home, but he's a fox in the box and if he keeps scoring he has to be in the team. "It's a bit strange [facing Alan Pardew] because I worked with him for four years but once I got off the bus I went into professional mode. After the game he said to me: 'Well done, you deserved the point.'" "Very good goals from Man City tonight. They were each really good, well crafted, the crosses were of decent quality and the arrivals of the players into the box was excellent. Credit to City for creating so many chances." Crystal Palace manager Alan Pardew: "I thought we should have won. We started well but the chances were few and far between. Newcastle only had one shot on target but scored. We struggled to break them down, but we scored a great goal - it was a really special cross and we deserved to get something out of the game. "We had plenty of options on the bench and in the end the bench made a difference. Yannick Bolasie and Dwight Gayle came on and upped the tempo for us. "It was nice to see my old team and my friends from the club. We took a point and we should be pretty pleased with that." Steve Howes: Everton came to foul. They were lucky not to see reds earlier. Justice was done. Daramola: Great goalkeeping from Cech tonight. He could have easily won my Man of the Match if not for Willian's late show. Uday Tumuluri: Unfortunately for Burnley it's a results business. Everyone liked a Cinderella story, but there aren't many out there, and for a reason. Chris Smalling scored with his first touch of the ball in this game; 22 seconds after coming on a substitute. This was the second fastest goal by a sub in the PL this season after Sammy Ameobi for Newcastle v Spurs (8 secs). Burnley have conceded a league-high 16 headed goals in the Premier League this season; six more than any other team. Since August 2013, Kieran Trippier has provided more league assists than any other defender in the top four tiers (17). Since 2010/11, Robin van Persie is the only player to have scored 10+ goals in each Premier League season. Manchester United became the 19th side to win a penalty kick this season in the Premier League - Aston Villa are the only side yet to win one this season. Wayne Rooney has still not had a shot on target in the Premier League in 2015 (in 540 mins). Another big win for West Brom at home, and the Albion are now up to 14th in the Premier League, and more importantly they are now four points clear of the drop zone. How important that could prove to be. Chelsea are unbeaten in their last 20 Premier League home games against Everton (W11 D9 L0). Chelsea have won 34 of a possible 36 points (W11 D1) in their 12 home games this season. Everton have won one of their last nine Premier League games (W1 D3 L5). Chelsea have kept 16 clean sheets in their last 20 Premier League home games, conceding just six goals in that run. Everton have won just 27 points in 25 Premier League games this season - 18 points fewer than they had at this stage last season in Roberto Martinez's first campaign as manager at the club. No Chelsea player created more goalscoring chances (3) or attempted more crosses (10) against Everton than Juan Cuadrado (3). Manchester United manager Louis van Gaal: "I didn't like this performance today. Of course, we have won and the result is fantastic. But after this match you cannot say that we are going up and I want to progress every match. Daley Blind has a headache and maybe tomorrow it is better. I don't think Blind will be out for next Monday's game. But for Phil Jones, I fear. I don't know. We'll have to wait and see tomorrow." Here's more from Everton manager Roberto Martinez: "Football can be very cruel. I think it's very clear that the home team are trying to influence the referee. From that point on it's unfortunate. We constantly see it here. We have to allow the authorities to look into it. "I think we've shown good signs in our recent performance. We've been really solid. What pleases me today is that we were very cute, frustrated Chelsea and created the best chances. That needs a good balance, especially at the hardest place in the Premier League. "It's been a difficult season but we're looking forward to the final third of the campaign and European football. The performance was dynamic, full of confidence." Chelsea manager Jose Mourinho: "Big game, big game. We found a different Everton, it's a compliment. A defensive Everton, very well organised and compact, very dangerous on the counter attack. They made it difficult for us. "We tried everything and the spirit was amazing. The pressure was strong and they were in trouble for the last 10 minutes. We scored a goal which the linesman disallowed very well but everyone was inside their box for the last 10 or 15 minutes. "In the end we got a very important goal. "I don't have a view of the melee. In the first half Everton made lots of fouls, every attack was a foul. Gareth Barry could have been sent-off in the first half and Roberto Martinez at half-time replaced Muhamed Besic because he was afraid of the red card. At the end the emotion was high." Everton boss Roberto Martinez told BBC Sport: "We were in control. We had clear-cut chances, the best ones of the game - they needed world-class saves from Petr Cech. It's a shame we couldn't convert the chances. It's a huge disappointment. Our performance deserved a positive result. "Every time a player loses a challenge it feels like the weight of the world is on the referee's shoulders and he feels he needs to react. To give Gareth Barry a second yellow card because of the reaction from Chelsea's players is disappointing. They surrounded the referee and their conduct was a real shame. It created a little bit of belief for Chelsea and the goal came as a consequence of that. It was a very scrappy goal - if you don't have the momentum often they don't end up in the net." Gareth: All the pessimism around Villa completely ignores the fact that a squad with class players like Benteke, Delph and Cole has quality in abundance and the next four games are eminently winnable. A smart managerial appointment to pep the squad up is all that's needed. Dave: Some people are calling the Chelsea victory lucky. They had 21 shots versus only seven for Everton. Fully deserved the win! Matt in Southampton: Mourinho delivering a title-winning performance tonight. Cagey 1-0 wins are what his champions are made of. Burnley manager Sean Dyche: "It's a tough business we are in and this game can sometimes kick you in the rear. The manner, energy and organisation... it was all on show tonight. But we have to turn performances into wins. I thought Danny Ings was terrific. But I could say that about the whole team." Manchester City manager Manuel Pellegrini, speaking to BBC Sport: "We returned to our normal performance, especially in the second half. We scored three goals in the second half and had more chances. "It is important, not just the score, but also because it is not easy to score four goals at Stoke. They have been the difficult team for us to score against while I have been here. It is a tough place to come. The most important thing was to win and in the way we did today." On Sergio Aguero's disallowed goal for handball: "Maybe he could not stop because he arrived running to the goal. It is difficult to understand." Stoke City manager Mark Hughes: "I was more than pleased with what we produced in the first half, in the second half there were factors that meant we were not able to get at them. You leave yourself open when you are chasing as the home side and that is what happened. "We have done really well in the last nine or 10 games. We did really well in the first 45 minutes but City were able to take it away with their bit of extra quality in the second half." West Ham boss Sam Allardyce on 5 live: "That's more than a good point. We had to cope with going down to 10 men, which was a very difficult decision to stomach. Our keeper was fouled, no doubt about that. And then Andy Carroll got injured again, and just had to stand up front as nuisance value. "The defending was absolutely magnificent and that point feels like a win. We've given our travelling fans a lot of heart with that spirit and the way we defended. "It's the same injury as before with Carroll. He was declared fully fit the other day, but it wasn't a dangerous challenge on him. It was a knock and it's caused him the same injury again, which is obviously a concern for us. That's a big blow, and we have a thin squad at the moment." Southampton manager Ronald Koeman: "If you play 30 minutes 11 against 10 then you have to score the goal but we didn't. Everybody was running and we didn't make the pitch wide to make the space. There were too many crosses and I think that is the easy way for them to defend. "I think we had one or two shots from outside the box and lacked sharpness up front. I said at half-time if we kept the organisation, the front players have to win the game tonight but they didn't. "You have to react and work harder and be sharp in the box. Maybe in one or two situations Graziano Pelle was a little bit unlucky but he was not on the level he can bring." "Paul Lambert wasn't at his best with TV. All the radio and press reporters will say he was good with us. He'd josh with us, give us gossip, be frank. He liked an anecdote about his time in Scotland or Germany. He was really good company, totally different from what you saw on the television. He used to sit and talk to us for 10 minutes before we even started. We'd give him pelters in terms of questions, but I respect him for never taking it personally. "That Villa squad is not a bad one, and if they go down I'd suggest that was one of the better squads to have been relegated from the Premier League. They just need a good coach on the tiller. They need to unpick that goalscoring lock. "Lambert loved Villa, loved the club. He was steeped in the club's history from day one. In his last game at Norwich they beat Villa 2-1 at Carrow Road. The Villa fans were chanting for him, and there was universal respect and approval for his appointment in 2012." West Ham manager Sam Allardyce on Andy Carroll's injury: "It was the same injury he has had before. He had a kick in the back of the knee and the injury has reappeared. He's done three days training and it obviously wasn't as good as we thought it was." On the potential signing of Lassana Diarra signing: "That's not going to happen because of administration reasons, which is a real shame. Fifa regulations apparently, so after all the work we've done there and to get a player of his quality with a lot to prove would have been a huge bonus for us." West Ham manager Sam Allardyce, talking about Adrian's sending-off: "It's a foul on the goalie. Sadio Mane had two hands around him. It's bizarre why they can't see it but this is what we have to stomach today and it nearly cost us dearly. It lost us the opportunity to win the game and we had to battle with nine in the end when Carroll got injured to get an unbelievable point. "It shows the character and resilience to get a fantastic result. It's almost like a win and a fantastic performance. " Chelsea goalkeeper Petr Cech told BT Sport: "This game was all about the first goal - and we got it. We had a few dangerous moments going forward. Everton played very well, they were brilliant the whole game and made it difficult for us. We had to wait for our chance to come and it came right at the end." I've still not seen a definitive replay of the melee at the end of the game. Will Branislav Ivanovic be facing some disciplinary action? Chelsea midfielder Nemanja Matic told BT Sport: "I think we did a great job. I would like to share my man of the match trophy with the other 25 players. We fought for each other for the 95 minutes. We won this game with our heart. This game showed that every game will be difficult, especially in this part of the season. We are a bit tired because of so many games. We will give 100%, we have to continue to play like we have been playing." Chelsea manager Jose Mourinho: "It's beautiful to win in the last minute, and it's so sad to lose. They have to be very disappointed, they gave us a very difficult match. We are very very happy and we think we deserve it. We fought so hard to try and win the game. "We risked a lot to try to win. It was a refereeing performance that in my opinion was very good. We had a goal which was fantastically well disallowed by the assistant referee. A great decision. "Everton changed its DNA, they defend really well and made lots of fouls. What we can call intelligent fouls. But if the referee follows the rules it's yellow card, yellow card and they paid the price for that. This is not a criticism, but they foul, foul, foul. "Did Branislav Ivanovic go in with his head? Don't make me laugh. Don't make me laugh." Everton boss Roberto Martinez told BT Sport: "The result is hard to take. You believe you'll get what you deserve - we didn't. "It was a performance full of spirit. Defensively we were very good and we created the best chances. There were a couple of world-class saves from Petr Cech. "The second yellow card for Gareth Barry is very harsh. It's an unfortunate goal to give away, the ball goes through a players' legs. But it allows us to carry on with a good level of performance. "My players were really upset about that [Branislav Ivanovic incident in the late melee]. It's the reaction of the Chelsea players you don't like. 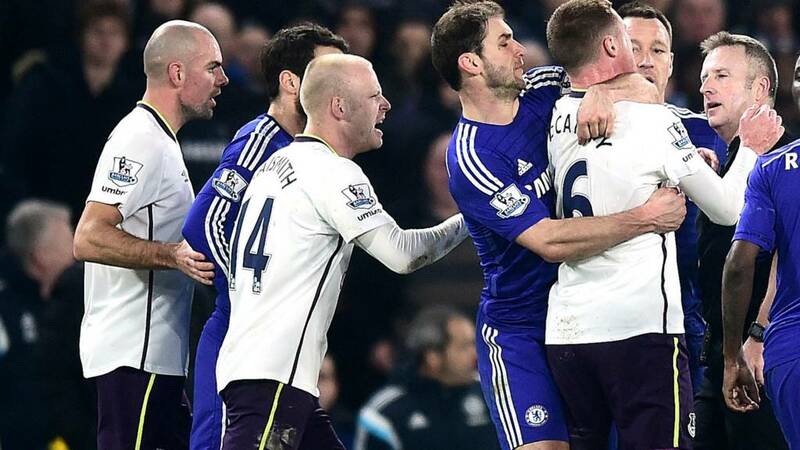 Ivanovic grabs James McCarthy by the throat. You need a strong referee for those matters. You have to take your chances. You don't want to see the incidents we saw at the end. "I was disappointed with the manner in which the referee dealt with it." 5 live Sport has metamorphosised into the 5 live Football Social. Call 0500 909 693 if you want to get on and discuss anything from Paul Lambert's departure, Manchester United's frontmen and Chelsea's late winner, among many, many more topics. Fairly standard for Celtic at Patrick Thistle in the Scottish Premiership - they lead 3-0 with goals from Gary Mackay-Steven, Stuart Armstrong and Stefan Johansen. Gamma: Pure luck for Chelsea. Mourinho has it down to a fine art. Robin Smit: If Burnley played like they did for the first 60mins tonight for the majority of the season they would definitely be in the top 10. Manchester City were pretty impressive tonight, with both David Silva and Samir Nasri linking up well and Sergio Aguero starting to look like his old self again. Of their 14 shots on goal tonight, eight were on target. Not a bad conversion rate. Brede Hangeland header again! What a save from Tim Krul, superb from the Dutchman to deny Palace a second goal. Everton boss Roberto Martinez calls defeat 'really hard to take' and calls Gareth Barry's red card 'very harsh'. Full reaction to come from all of tonight's games. Palace attack brightly again but Fraizer Campbell takes a wrong turn and ends up down a cul-de-sac. Is there a winner in this one? "If Burnley perform like that every week their survival is possible. They work ever so hard as a team, they understand each other's games. But the same old frailties are on show every week, and it always costs them." Southampton had 21 shots on goal tonight, but only seven were on target. The Hammers chanced their arm four times, with Fraser Forster making just one save. "Over the season so far Southampton have had the rub of the green, but tonight it just didn't run for Saints. They could not find that extra bit of magic, flair or imagination." A very solid night for Dougie Freedman and co. Wigan - it's looking like League One. Big scenes of celebration from the Chelsea players at full-time, they know that last-minute goal could prove very important come May. What exactly happened with Gareth Barry? I'm not so sure - I'll try and see some replays now. "A massive win. Stoke had a foothold in the game in the first half but after the interval Man City showed their class. They scored four and it could have been more." Palace close to a second as Brede Hangeland sees a header deflected onto the roof of the net. Can the Eagles get a winner now? "It was a bit of a breeze in the end for Manchester City, but there was plenty of incident along the way." Good performance by Manchester City. "I thought Everton had rode their luck for the day, but despite the fact they dug in as a team Chelsea have enjoyed all the play and deserve their goal." Branislav Ivanovic was heavily involved in that melee which saw Gareth Barry dismissed. He certainly had a bear hug on an Everton player. The game is petering out now, and Stoke take the opportunity to give a debut to 17-year-old Oliver Shenton. His appearance comes in the same week of the funeral of his mother, Mandy, who sadly died of cancer. What a few minutes at Stamford Bridge! Nemanja Matic thought he had scored, it was ruled out, Gareth Barry was dismissed in the melee afterwards and then Willian squeezes in a deflected effort. Chelsea look like keeping a seven-point lead at the top. Jose Fonte has a dig from range and his shot is turned round the post by Jussi Jaaskelainen. "Gareth Barry's trip was obviously intentional and he's been sent off. There then followed so much heaving and shoving. "And absolutely incredible scenes straight after. The hallmark of champions is winning games ugly and when you don't play well. I don't see 10 man Everton responding to this." United almost get a fourth but Tom Heaton saves Angel Di Maria's shot before the follow up from Adnan Januzaj is cleared off the line by Jason Shackell. Brown Ideye and Saido Berahino combine again for West Brom and this time it is the latter who fires home from 12 yards from his strike partner's cut-back. The new partnership appears to be blossoming. Chelsea do find a way through! And it's deflected again! Willian meets Tim Howard's punch out with great technique to strike the ball on the half volley and it deflects into the corner. Southampton are throwing the kitchen sink at West Ham now, but Graziano Pelle can't get a shot away and is crowded out in the penalty area. Maya Yoshida then heads over. There's a right old melee in the aftermath of that goal being disallowed and in the dust-up Gareth Barry is shown a second yellow card. I didn't see exactly what he did but he's off. Christopher Mears: I'm surprised that the club have sacked him. I thought they would have kept him at least until the end of the season. But it makes the chairman a scapegoat because he refuses to put 'real' money into club as he still wants to sell to a buyer. Colin Carberry: Randy Lerner's utter ineptitude comes to the surface again. Most sensible people knew a year ago that Lambert was totally out of his depth, but Lerner signed him on a lucrative new long-term contract. Now Villa will have to pay him millions in compensation, just like McLeish before him. If Villa had spent half as much on players as they have on compensation, they'd be in the top half of the table, rather than fighting relegation season after season. Alan Pardew goes big! A huge celebration on the sidelines as substitute Fraizer Campbell pokes in an equaliser for Crystal Palace. He reaches well to meet a cross from the right and toes it into the net. West Ham are effectively down to nine men now, with Andy Carroll pulling up injured. Big Sam tells him to play on, but he's in clear pain. Controversy! Chelsea think they have scored as Nemanja Matic's shot is deflected in - but the flag is up. Branislav Ivanovic is offside and the ball struck him on the way in! More good work from Brown Ideye wins a corner on the left of the box. Perhaps he is a confidence player after all and may well come good for the Albion? "Frustrating. Arfield dived in and he didn't need to. The ball was travelling down a blind alley. "Burnley have not picked up men at corners and have dived into challenges within the area, and it's asking for trouble. And it's such a shame because Burnley have been good. They have certainly not been outplayed and in certain areas have made Manchester United look very ordinary." Yannick Bolasie - back from the Afcon - and Dwight Gayle are now both on for Crystal Palace. The hosts need them to fire. Easy as you like, Robin van Persie sends the keeper the wrong way and Manchester United put the seal on a likely three points. Scott Arfield brings down Angel Di Maria in the area. Penalty all day long. A fan invades the pitch at St Mary's, with play going on temporarily while he runs about the turf waiting to get tackled by a steward. When play is suspended, the man is caught and bundled down the tunnel. Into the last 10 minutes at our 19:45 kick-offs. Any late drama? Ronald Koeman gives a debut to new signing Filip Duricic, who replaces Sadio Mane. Palace have been very flat this evening. Disappointing stuff for Alan Pardew to watch. Onipede Bamidele: Why are the Man Utd players so lethargic? Edward Taylor: Van Persie is the problem at United. Out of form, but still being played and forcing others to play out of position. Get Rooney up front. Cameron Laws: Really feel for Falcao. He's not been great but we didn't create a single chance for him, not one. Our style of play is awful. Manchester City might be cruising but Eliaquim Mangala continues to look a liability as he goes shoulder to shoulder with Mame Diouf and the striker goes tumbling in the area. Referee Lee Mason says it's not a penalty, though. Looked 50-50 to me. The visitors, meanwhile, have brought on Frank Lampard for David Silva. The more Chelsea push on for a winner, the more they leave chances at the back. Kevin Mirallas picks the ball up for Everton 25 yards out and whistles a shot over the top. Surely this can't end 0-0? West Ham are defending bravely and Aaron Cresswell makes a superb block to deny Nathaniel Clyne. "A great individual goal from Nasri. He started on a mazy run, wondered how far he could go, it took him into the penalty area and after a quick look up he hit a right-footed drive into the back of the net, and that's 4-1. "People all over the world will pick up the papers in the morning and see this scoreline, and think Stoke have been pasted. But that hasn't been the case at all. This has been a really hard-fought Man City win." "Roberto Martinez's ploy now is to collect a point, and a well-earned point. And John Stones has been really solid at the back, alongside Phil Jagielka, against one of the best frontlines in the country." Manchester City are heading for their first Premier League victory at Stoke thanks to Samir Nasri, who scores his side's fourth when he runs across the box before planting a low shot into the opposite corner and beyond Asmir Begovic. Two in two for West Brom record signing Brown Ideye, and this is a really tidy finish indeed, swivelling on to a loose ball and firing low and into the corner. It's not been a good game, but the hosts are in charge now. Not much happening at Old Trafford in terms of chances, but Burnley are still fighting hard and should not be ruled out. Have a look at Wayne Rooney's touch map below. Too deep? "Randy Lerner is nothing if not obdurate - billionaires can afford to be so, can't they? He was determined to ride out the storm and with Paul Lambert he had the best relationship he had had with any Villa manager. "Two weeks ago the club were bullish. But I think what's happened involved yesterday's remarkable TV rights deal. That will have played on Randy Lerner's mind. "I still believe he'll sell up during the summer. He still wants to sell, and to a certain extent he's protecting his investment here. He'll be terrified about Villa going down, who have not been relegated since 1986-87. But the way they've been playing they look as if they could. I don't believe they will - they have a very good squad of players. They just need some sophisticated, modern coaching." Into the last 20 minutes. On the one hand Everton should be dead and buried, but on the other they could easily be ahead. How Romelu Lukaku failed to score that chance is a mystery to everyone inside Stamford Bridge. Sergio Aguero won't have a chance to go for his hat-trick. He's heading off for an early bath, to be replaced by Edin Dzeko. Southampton are making hard work of breaking down West Ham's 10 men. It must be something to do with Big Sam's sophisticated tactics. Graziano Pelle has not brought his shooting boots and blazes over from just inside the area. "Cameron could have tackled Silva but he tried to nick the ball but Silva was too tricky for him. It was a definite penalty, but it seems from Stoke not making an earlier challenge. Manchester City have never won here in the Premier League, but tonight looks as though that's all going to change." Two subs for Chelsea, Didier Drogba and Cesc Fabregas on, Loic Remy and Juan Cuadrado off. Chris, Hull fan on the Wirral: Reminds me of when Hull sacked Phil Brown and appointed Iain Dowie at completely the wrong time, we went down needless to say. Ben Wilkinson, UK: RE: Lambert Sacking. Theoretical question - When are players going to be made accountable: for poor performances in getting "Sacked" by their clubs? Player Power. Sergio Aguero scores these with his eyes closed. He steps up, opens his body and guides the ball into the corner. That was the chance for Everton! He has to score! Bryan Oviedo whips the ball in from the left, Romelu Lukaku is free no more than six yards out, makes a decent connection and somehow Petr Cech makes a brilliant save with his left foot. The keeper gets a standing ovation for that. A rare sight. Lukaku should score really. But a great save. David Silva spins away from Geoff Cameron who grabs at the playmaker's shirt. Penalty. Manchester United are beginning to pen Burnley in a little bit. The Clarets' defence looks well drilled though and is hard to break down. Chelsea still probing away but Everton have been resolute in defence thus far. And that's another good save from Tim Howard, down to his left to push out a Willian curler. All going swimmingly for Dougie Freedman on his first home game in charge at Forest. Free flowing almost, with Lansbury's goal adding to goals from Britt Assombalonga and Chris Burke. Get Freedman in at Villa. Jb73: Big Ron should be in with a shout! Stuart Knight:‏ I'm not one to advocate the sacking of a manager however I do believe Villa have made the right decision, but at the wrong time. Angel Di Maria jinks into the penalty area and goes down, but is told to get back up by the ref. No penalty. Nemanja Matic lines up a free-kick from 25 yards out, and Tim Howard makes a flying one-handed save to keep it out. Great display so far from the returning veteran. "I cannot understand what gets into the goalkeeper's minds! The mist must just come down! West Ham have to make some serious changes now." Jussi Jaaskelainen is Adrian's replacement in the West Ham goal. Carlton Cole is the fall guy. Our two 20:00 kick-offs are back under way. Eden Hazard skips away from a man to get a shot in but Tim Howard deals with it easily enough. It's looking like Chelsea will need either a moment of genius or a defensive error to find a way through tonight. A turning point at St Mary's? Hammers goalkeeper Adrian tries to beat Sadio Mane with some nifty footwork but stumbles and, in his panic, dives on the ball outside the penalty area. Got to go. "This game is definitely not over, and I don't want it to be. This is a great contest! Both of City's goals have been brilliant, each in their own right." Adnan Januzaj with a low shot which takes a deflection but Tom Heaton gets down well to save. Chelsea's lead at the top of the standings is currently down to five points after that Manchester City goal. Title race on? "Milner has substance, hasn't he? He can play in all sorts of positions and he ghosted into the penalty area. A great finish with his head." The game opens up as Graziano Pelle fluffs an effort - it's practically an air shot - at one end and West Ham race on a counter attack which ends as Stewart Downing sees a shot deflected wide. Former Aston Villa striker Peter Withe: "I think it was inevitable. I thought with the way results were going with the club not scoring goals, the football was a good passing game but they were not creating chances. "Lot of names have been bandied around - and I am sure they have not done this on a whim. "Paul Lambert should have brought in someone who had more feeling for the club and I think that has cost him really, someone else to bounce ideas off. Once Roy Keane left he has not had anyone to do that. "The most important thing is to get someone in who is right until end of season, they have to get someone with a feeling for club and who can bring the fans back and inspire them." Barcelona recorded their 10th victory in a row by beating Villarreal in the Copa del Rey semi-final first leg. The hosts dominated the first half but did not lead until the 41st minute when Luis Suarez set up Lionel Messi to sweep home from 16 yards out. Manu Trigueros levelled soon after the break but Andres Iniesta restored the hosts' lead. Gerard Pique added a header but Neymar had a penalty saved that would have put Barca three goals clear. Manchester City shrug off that failed penalty appeal and take the lead instead - Samir Nasri putting a nice ball into the box and James Milner is unmarked to head home. Brian Little was Villa manager between 1994 and 1998. Is he a serious contender?Why not Graham Taylor again? Sergio Aguero is one-on-one with Philipp Wollscheid in the Stoke penalty area, and is tripped by the centre-half. Penalty... surely... referee Lee Mason says no. Manchester City can't believe it. "It could be Tim Sherwood. If he reined in one of two of his tenancies that irritate chairmen, he could very very good, because he knows all about youth teams and academies. I feel they need a modern coach - look at the top three teams in the Championship. "There are only 13 games to go, and the key thing is to keep Villa up. Former boss Brian Little is only 61 and lives in Stafford. They need someone who can hold the fort, who knows the DNA of the club... why not Brian Little?" It's too slow from both sides, but Everton are so deep, they have 10 men inside their own penalty area at times. It negates the threat of Eden Hazard getting behind their defence but when they do get it back, Romelu Lukaku is incredibly isolated. Where would Manchester United be without David De Gea? The Spanish keeper makes another fine save, this time to deny Danny Ings from six yards out after a mistake in the Reds defence. I wonder if Chelsea's players know that Manchester City are being held at Stoke? This could be a chance to grow their lead by two more points. Chelsea have lost their early flow. There's's been plenty of chances in this game, and Manchester City have another when Aleksandar Kolarov races through down the left but his shot is tame and straight at the keeper. Sergio Aguero wanted a square ball. Time for more action in our 7.45pm kick-offs. West Ham have made a change at Southampton - sending on Matt Jarvis for Enner Valencia. Newcastle defender Fabricio Coloccini appeared to be struck by an object from the crowd as the visitors celebrated their opener. Pam Nash: Roy Keane can go back to Villa now, as manager. Jonathan Funnell: Come on Villa, take a punt on Eddie Howe. Young, good football and we need a fresh start, not the usual names. Just a couple of weeks ago Aston Villa chief executive Tom Fox told told BBC Radio 5 live's Pat Murphy that the club were fully behind manager Paul Lambert - and that he remained important to owner Randy Lerner. Fox told BBC Sport sacking Lambert mid-season would be like "flipping a coin". It ain't false no more. An excellent 'number nine' goal as John Carver takes the lead against Alan Pardew. Newcastle right-back Daryl Janmaat does all of the donkey work down the right, beating his man and digging out a great cross for Papiss Cisse to hammer into the roof of the net. He didn't have to jump, the cross was that good. It's against the run of play but Newcastle lead. Match of the Day is on tonight. Burnley had 10 attempts on goal in that first half, compared to Manchester United's three. The scoreline doesn't reflect it though. "Paul Lambert never, ever ducked anything. He never ducked a press conference, in all his time at Aston Villa, before or after a game, and to the best of my knowledge he never held anything against me. I just asked him straightforward questions. "He's a tough Glaswegian, he can look after himself. And he'll get over this one. In certain areas I don't think he did a bad job, but that's a heretical observation for many Aston Villa fans." It's well, er, pretty dull at The Hawthorns. Neither side particularly close to a breakthrough at the moment. James, Manchester: Disgraceful first half. Worse than anything under Moyes. Completely bossed by the team bottom of the table at home. Send Falcao back now. "So frustrating. Burnley have been absolutely brilliant but two crosses, two goals conceded and they've gone into half time 2-1 down. Nobody went in with Smalling. Wrestle him, tackle him, do anything but don't give him a free header. Criminal from Burnley." Fraizer Campbell heads Palace into the lead - with a deft touch - but he is a yard offside. Palace still on top. Burnley have put up a great show... but it's counting for nothing at the moment. "Sergio Aguero used his hands and deserved to be booked. I called it immediately. I'm sad to say that he knew it was handball straight away. He helped it into the net after the ball popped up off his foot. It might have been instinctive." "Southampton have been frustrated by West Ham. Bags of endeavour, just not much by the way of end product so far." Still relatively even at The Hawthorns, with Swans midfielder Jonjo Shelvey firing over the top from 25 yards. West Ham had little time to prepare for this game according to manager Sam Allardyce but they have been organised and resolute, restricting Southampton to just one clear-cut chance when Sadio mane saw a shot hacked off the line. "A frantic first half at the Britannia Stadium. Sergio Aguero got one and thought he had two, instead he is the only player with his name in the referee's notebook. Stoke 1-1 Manchester City." All looking good for Barcelona in their Copa del Rey semi-final against Villarreal - they are now 3-1 up in the first leg of their tie, the goals coming from Lionel Messi, Andres Iniesta and Gerard Pique. Twenty minutes left in that one. Hmm, that said, Neymar has just had a penalty saved. Make Chris Smalling's a double. The substitute puts Manchester United back in front against the run of play when he rises high to plant home Angel Di Maria's corner. Controversy at the Brit. Manchester City think they've retaken the lead when David Silva crosses for Sergio Aguero who converts from close range. However, the goal is chalked off because the linesman saw a handball. And Aguero is booked. It's suddenly all gone a bit flat at Stamford Bridge. The first-half has petered out but Chelsea were looking very dangerous for the first 25 minutes or so. Britt Assombalonga has put Nottingham Forest 1-0 up against struggling Wigan in the Championship. Good news for Dougie Freedman in his first home game in charge. Great chance for Manchester City but Fernandinho sidefoots wide from eight yards. Del Fitzsimons: Lambert never had the support of the fans, so it was about time. Robert O'Donnell: Lambert showed at Norwich he is a great manager, just couldn't repeat that at Villa. He is a great Championship manager, just not Premier League quality. Jonathan Collins: I feel sorry for the man. It is the players to blame for not playing well - they shouldn't blame the managers. Shame on the players, they should get their wages taken off of them. They've made a great manager get sacked. Still all Burnley at Old Trafford and Michael Kightly plays in Ashley Barnes on the inside but the striker's first-time shot is hooked wide. With Daley Blind going off injured, Wayne Rooney has dropped into the holding midfield role. He'll end the season in goal at this rate. Yaya Sanogo is injured for Crystal Palace, the striker limps off and Fraizer Campbell is on. Can he bring a goal with him? There's more happening at The Dell than St Mary's tonight. Both sides cancelling each other out. The very early odds have Tim Sherwood and Jurgen Klinsmann as the early favourites for the Aston Villa job. "It had to happen. Peter Crouch has been unstoppable. It was a beautiful cross, absolutely perfect height, trajectory and curve, right onto the head of Crouch. And believe me, there is no better head for a ball to fall onto. It was a 'good morning' ball. Nod your head, 'good morning', and it's a goal." This has been a first half to forget for Manchester United. Now Daley Blind is coming off injured, with Ander Herrera making an earlier than expected introduction from the bench. Burnley are still on top. "That was the cross of the season from Marko Arnautovic. He celebrated like he'd scored it, and I don't blame him." After Tuesday's defeat against Hull, Lambert admitted he was aware of fan discontent and said his team's remaining Premier League fixtures were "13 cup finals". Villa have not won in 10 Premier League matches and dropped into the relegation zone after the 2-0 defeat. Some fans held up 'Lambert Out' banners, and the Birmingham Mail called for the manager's sacking. Lambert said: "I was aware of [the discontent] months ago. I've told the players, they've got 13 cup finals." But they will have to get through those without Lambert. Time to bring Roy Keane back? He seems to save his best for Manchester City. Peter Crouch, who scored that absolute worldy against the Blues a few years ago, draws Stoke level when he heads home Marko Arnautovic's stunning cross from the right. "Juan Cuadrado looks a real talent with explosive pace. Whenever he gets on the ball he's looking to get in behind people and he looks like a valuable addition to this Chelsea squad." Ismail Bawa: Can't believe Burnley are playing like Real Madrid and Man Utd are playing like Bury. West Brom winger Callum McManaman has had a shot over the top from a wide angle as the hosts continue to look for a breakthrough. Not too many goals around tonight. "I can see what people meant about City missing Toure. He offers quality, linking up with the strikers. Aguero has been feeding off scraps but he's managed to get a scrap, run against the centreback and bury it into the corner. A fantastic finish. That was a goal from nothing." Brilliance from Tim Howard! The veteran makes a sprawling save to keep out Branislav Ivanovic's piledriver before somehow hooking it away from the onrushing crowd with his toes. Sheer willpower from Sergio Aguero. James Milner hoofs the ball up field in the general direction of the little Argentine who shrugs off a slip while tangling with Marc Muniesa to drive forward from the halfway line and eventually drill a low shot past Asmir Begovic. Manchester United only look a threat when they go long tonight. Hit the big man, LvG. Leave the pretty football to Sean Dyche. "It doesn't surprise me that Paul Lambert has gone. He's been trying his best to turn that team around, but Christian Benteke hasn't scored all season and Darren Bent is scoring for fun on loan at Derby. And they're at the bottom of the league and really struggling." "Burnley look like they are going to score at every attack. The game is just so open, and Manchester United are being forced to play on the counter-attack at home to Burnley!" The snap's missing from Manchester City's play once again. This time Sergio Aguero shoots well wide from 30 yards out. Get Paul Lambert in. Joe Ledley heads over the top from a Jason Puncheon free-kick on the left. Palace still on top at Selhurst Park. Southampton winger Eljero Elia gets to run at the Hammers defence and cuts in on his right foot but drags the ball across goal and wide of the far post. West Brom defender Craig Dawson flicks on a corner and Swansea just about scramble it clear from right on the line. Almost. That silver strip Burnley are wearing resembles a knight's armour as they throw their bodies in the way of everything. They are really up for this one. Branislav Ivanovic blazes a sitter over the bar! But his blushes are somewhat saved by a flag as the ball had crept out of play at the far post. Chelsea are all over Everton now. Steve Huish in Surbiton: I think its really good timing by Villa as it gives a new manager a chance and time to stay in the Premier League. Lambert should have been sacked a long time ago. Will: Villa can have Nigel Pearson if they are looking for a manager for the Championship.! Nick, Pontefract: When clubs sack a manager do they just copy and paste "x would like to place on record it's thanks and take this opportunity to wish him every success in the future". I strongly suspect they couldn't care less. First Phil Jones went off injured, now Daley Blind is receiving treatment for a gashed head. He should be fine... but Manchester United are quickly realising they are in a real battle this evening.